The hottest probes on the planet are from Munich! 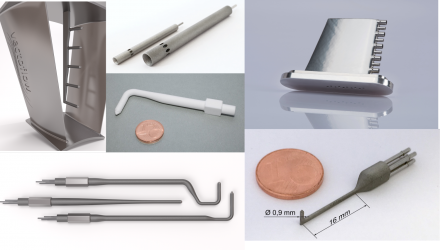 The Munich-based startup Vectoflow is making quite a stir in the fluid measurement market with their probes, which are not only smaller and more robust that the rest, but can also heat up to roughly 3270°F. Business is going well, which justifies the ambitious goal set by the founders: for Vectoflow to be the global leader in flow measurement technology in three years’ time. The challenge they faced: to develop probes that can be perfectly adapted to their application, are smaller and more robust, and easy to integrate into nearly all existing systems. Although the three founders are specialists in their fields, technical support is always welcome. Katharina studied mechanical engineering with a focus on aerospace technology at the Technical University of Munich. She then completed her MBA at the Collège des Ingénieurs in Paris. During her studies, she worked in the field of flow measurement technology for BMW, Airbus and NASA. While at BMW, she got to know Christian who had completed his doctorate in the field of fluid mechanics. The two started to work on the concept of developing innovative probes. Katharina’s MBA colleague Florian then came on board and completed the team of founders, which is now organized as follows: Katharina primarily handles sales and production, Christian mainly deals with software and calibration and Florian takes care of product development and finance. 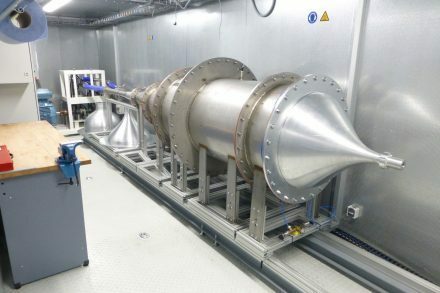 The calibration wind tunnel, which can accelerate air up to Mach 1.4. The odds are certainly looking good.